Time VS Money: Are DIY Invitations Right for You? How much is too much to pay for wedding invitations? That's a tough question! Every couple has different priorities when it comes to their wedding budget. In our current economy, most people are willing to sacrifice a few frills in order to save money – but cutting costs doesn't necessarily have to mean cutting corners. If you're soon-to-be-wed and willing to spend a little more of your time to save some of your cash, then DIY wedding invitations could be the right option for you. The good news is that the market is catching-up to the prevailing do-it-yourself trend. There are a lot of great options out there, so if you're feeling a little crafty, you will probably not have to compromise at all. You 're just trading a bit of time and personal work, but not quality. The following guide gives you the low-down on the different style and assembly options out there for DIY wedding invitations. We've also done the legwork for you and picked out selections from some of the top DIY wedding invitation retailers online and in Canada. DIY Wedding invitations may come with one or a combination of the following assembly requirements. Printing the invitations and/or envelopes. 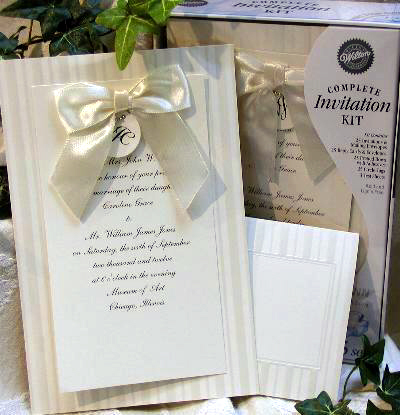 Some DIY kits come with MS Word Templates on CDs, so you can fill in your wedding specs and then print the invitations and/or envelopes yourself. If you're printing on cardstock, be sure to use a laser printer with a through/flat feed. If you're printing on paper, an inkjet printer will do. Folding and assembling the invitations. Whether you fold them, attach layers of vellum or both, certain DIY invitation kits require that you assemble the invites yourself. Attaching and tying ribbons. 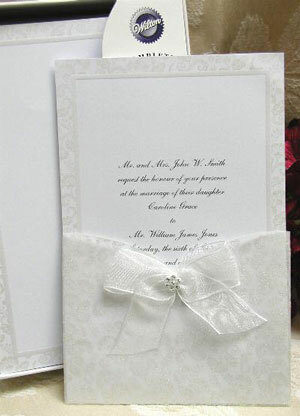 If your DIY invitations include ribbons, raffia, or some other embellishment which requires tying, they will most likely arrive unattached to the invitations. DIY and "name brand" may sound like a contradiction, but it works! The following two companies are very successful in providing "elegant blanks" which you can then turn into exactly what you had in mind.. 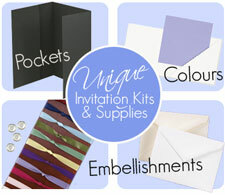 This is as close as it gets to a stationary superstore.. all kinds of envelopes, cardstock & embellishments, in different colours and textures. Canadian-based, quick service, including phone support. Pretty much exactly as above, only its perfect compliment, focusing exclussively on the every-popular Envelopments® line (which is not available at Wed. Inv. Supplies shop, above). So between these two (and Paper Garden, below) you are mostly covered for bulk paper & stationary. Milestone actually offers the "in-between" service: they will professionally producse the different pieces for you and then ship them to you "bulk", so you can do your own assembly and save money..
DIY meets eco-chic with these pocket folder wedding invitations, one of the unique DIY items from MDC Designs. These mulberry folders are made from sustainable cardstock and come with recycled PCW paper. . You get to select your own colour and closure style, from satin ribbon to your own personalized seals. 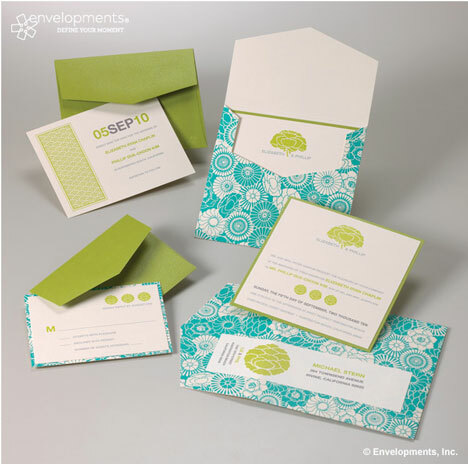 Pricing for mulberry pocket kits begin at $30.75 and include 10 pocket folders, 10 reply envelopes, 10 invitation envelopes, 11 invitation panels and 6 RSVP panels. We featured Paper Garden in a previous article on DIY Wedding invitations and were impressed with their wide selection of 80+ different colours of metallic paper with matching envelopes. 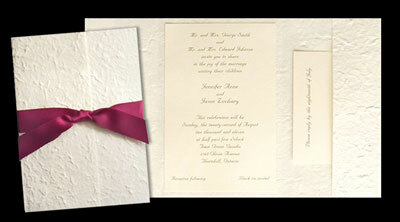 They also offer a comprehensive guide on how to choose a design and budget for your invitations. For 2011 they have..